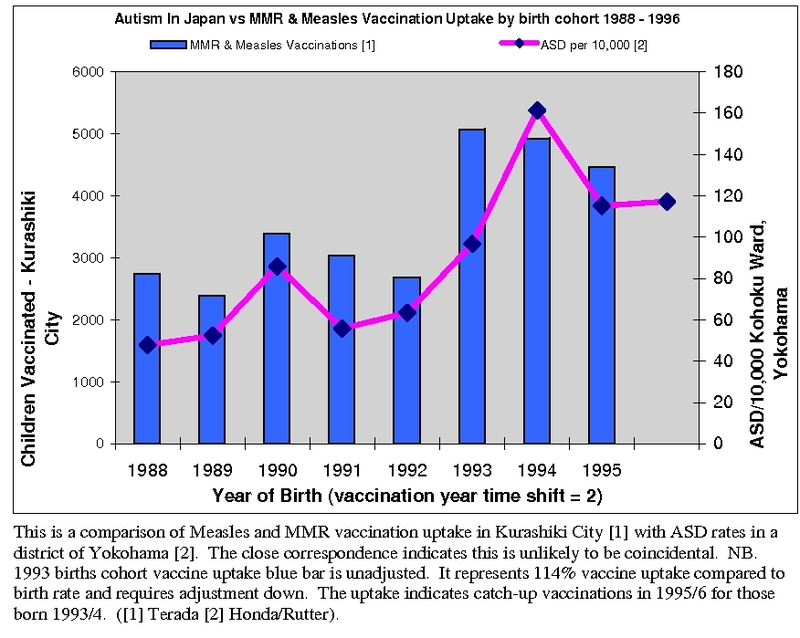 We previously published data from Japan showing a clear causal link between changes in the Japanese vaccination schedules and corresponding increases and decreases in rates of children having autistic conditions:- Japanese Data Show Vaccines Cause Autism. 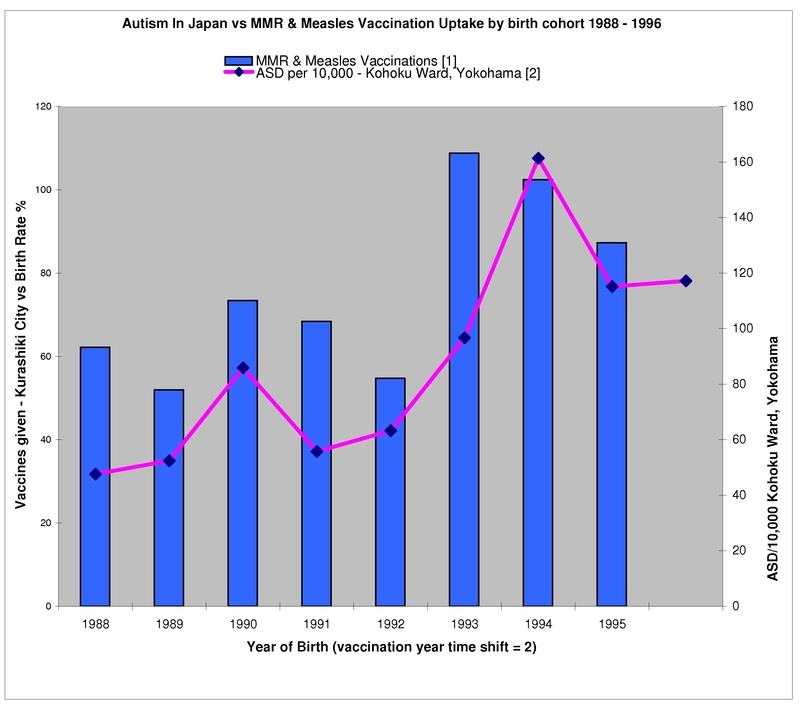 The UK’s Joint Committee on Vaccination and Immunisation’s irresponsible and only answer to the Japanese data was it was “not UK data”. 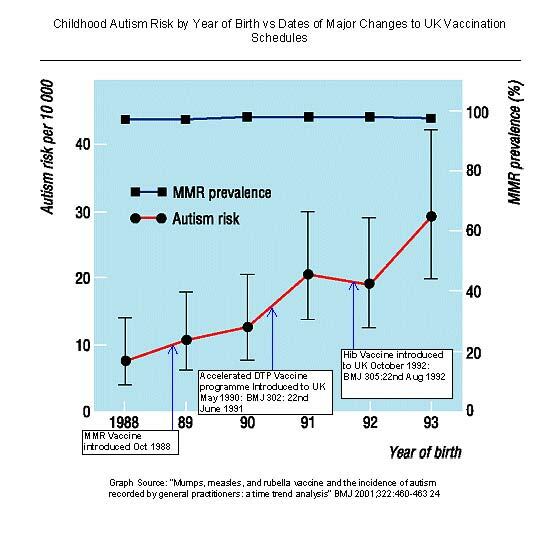 Data from the UK’s General Practice Research Database shows that with each major change in the UK childhood vaccination programme the rates of childhood autism have increased significantly [Full Details Below]. Thank you for this information. To me the link between vaccination and autism and other disorders is undeniable. If a child is developing normally and then shortly after vaccination begins to regress and never recovers, the obvious conclusion is that the vaccine is to blame. This would be true if it were only one child but when this is repeated many thousands of times it must be undeniable. In fact the mass vaccination of children could be regarded as a giant trial that should conclude that vaccination can cause autism. However, the kind of figures and the graphs on this post are extremely useful to help make the point to politicians and the public. I would like to know more. For instance, how many of those cases of autism showed up immediately after, or within a few days or a week of vaccination? How many of those children also have bowel problems? I have posted this page as a link on the cryshame website on Facebook which supports Dr Wakefield and the other 2 doctors. Is this the latest research? It was published in 2001 and the data end in 1993. What has happened since then. I’ve read elsewhere that the increase in autism rates are simply due to increased diagnosis, not increased incidence. In other words, many children that are diagnosed with autism today would not have been diagnosed with autism 20 years ago. This is a good thing because it means that children who 20 years ago would not have received the help that they needed will now get the recognition and assistance that they need. I’d be interested to here people’s thoughts on this, because the argument seems quite convincing to me. [ED: What has happened since 1993? The prevalence of autism has increased dramatically. It is now 1 in 64 in the UK. The above 2001 paper is an example of the unscientific approach of medical researchers who have unexplained data and do not ask or attempt to answer the questions a scientist would. The better diagnosis/recognition argument bit the dust ages ago with those in the know and in more recent studies. The argument means twenty years ago 95 out of every hundred cases of autism went unnoticed. Childhood/typical/Kanner autism in particular is difficult to miss. “UC Davis M.I.N.D. Institute study shows California’s autism increase not due to better counting, diagnosis“. If the increase in autism was simply a result of a change in diagnosis then we should ask where are all the autistic people over age 30? The study in the link provided by Daryl simply states an opinion without any data to support it. This is what many of the so called “scientific studies” that “prove” autism isn’t cause by vaccines end up doing. They will claim that empirical data and scientific research are not scientific, but that their opinions are science…which of course to any actual scientist is complete nonsense. Studies such as that are nothing more than public relations and marketing funded by vaccine manufacturers ….. because they may not have done any actual research …. . Severe cases of autism could never have been missed but my experience from teaching tells me that milder forms are rarely diagnosed. I left teaching ten years ago. I taught four year olds and I noticed four boys in my last three years who could not relate to other children and who exhibited odd and inappropriate behaviour, which I thought to be autism. One was a typical Asperger’s syndrome child. However, I was not allowed to diagnose. Only the educational psychologist was allowed to this and he told me that “we do not put labels on children”. I think this attitude is the same today. The website http://www.cryshame.co.uk has a film “Selective Hearing, Brian Deer and the GMC, Dr Wakefield, autism and MMR Film”. This shows the experiences of the parents in the Dr Wakefield case. Keith and Ed., I am sorry if you don’t have access to the full paper I linked to (am happy to send you a .pdf if you’d like), but the authors use a lot of data published by many different researchers to come to their conclusions. Much as this website does. So while this paper might have some interesting things to say about the topic, I’d hardly call it authoritative. In regard to the question about adults with autism, the NHS recently did a study on exactly that. It appears that 1% of 30 year olds have ASD, in line with the percentage of children currently diagnosed with the disorder, and way higher than the diagnosis rate 25 years ago. It is sad that many of these adults were not correctly diagnosed as children and did not (and still don’t) receive the support that they really need. Since when are adults 16 years old? That’s the 1994 birth year. Hi again. I’ve read your article and I’ve read the NHS report. I read one highly informative, well written, properly justified and statistically sound report, and one rambling conspiracy theory. I’ll leave you to decide which is which. [ED: Hah. When people fall back on alleging “conspiracy theories” you know the argument is won. Thanks for your “balanced” summary. Just one more question, and then I’ll go away. Do you believe that there is a conspiracy by the government (and public service), multiple universities (and their researchers) and pharmaceutical companies in multiple countries to use vast sums of taxpayer money to provide increasingly large doses of ineffective vaccines that are known to harm children? [ED: Daryl, thanks. Even when you are presented with the kind of evidence shown in this article you are unable to accept it and fall back on accusing people of conspiracy theories. No one needs them. There is a long and well documented history of corruption in the pharmaceutical industry and commercial medicine running through many levels, including government and medical publishing. You can start with the thalidomide scandal, psychiatric drugs and run through them all including recent ones like Vioxx. Do you believe they never happened? Some people believe the holocaust never happened. Is that the category you are in? Conspiracy theory (n.) A theory seeking to explain a disputed case or matter as a plot by a secret group or alliance rather than an individual or isolated act. [ED: Daryl you are not even close. 1) “long and well documented” is fact not theory and 2) corruption does not mean “conspiracy” (check your dictionary more carefully in future we suggest). Or are you saying British Members of Parliament who 1) claimed large amounts of expenses they were not entitled to 2) sat round a table and conspired to do that and 3) there is no evidence of any of this so it is your theory. You are right, I did promise to go away. But then you suggested that I might be a holocaust denier, and, well, I felt obliged to renege on my previous promise. So, on to your comment. 1. Using the term “long and well documented” when the facts are disputed, and all parties involved deny your allegations, is exactly what a conspiracy theorist would say. 2. I never equated corruption with conspiracy. The sentence you wrote is “There is a long and well documented history of corruption… running through many levels…”. This is a textbook example of a conspiracy. Corruption per se does not require a conspiracy, but coordinated corruption does. The thing that amuses me is that I have no qualms with conspiracy theories, I have some myself. For example, I believe that there is a conspiracy by some highly polluting industries, some scientist and some government officials to deliberately and dishonestly promote public confusion about the science of global warming, for their own personal gain. I also accept that there have been multiple conspiracies in the pharmaceutical industry to hide unwelcome results. I also believe that it is possible (but in no way proven) that there is an environmental trigger of autism, and it is also possible (although unlikely) that various researchers are being coerced into obfuscating the issue to hide such a link. There is nothing wrong with conspiracy theories and there is nothing wrong with being a conspiracy theorist. But you are insisting that everything you write is uncontested fact, and that is just plain ludicrous. Still, even if that was true, you’d still be describing a conspiracy, it would just be a conspiracy fact rather than a conspiracy theory. [ED: If you want to dispute “There is a long and well documented history of corruption in the pharmaceutical industry and commercial medicine running through many levels, including government and medical publishing.” you are more than welcome but that does not overcome the first problem you have which is there is just such a long and well documented history. If you want to claim it is all a conspiracy theory, you are also welcome to do so but you also have a problem in that it is neither conspiracy nor theory. Silly me for thinking I might get reasoned arguments here. Instead I get “because I said so” and an increasingly patronising attitude (“Night night son”?). That is all. [ED: How terribly frustrating it must all be for you. “There is a long and well documented history of corruption in the pharmaceutical industry and commercial medicine running through many levels, including government and medical publishing. You can start with the thalidomide scandal, psychiatric drugs and run through them all including recent ones like Vioxx. Sorry. You are right. There is a long and well documented history of corruption… etc. I apologise for suggesting otherwise. I misinterpreted your comment, and thought that you meant that the contents of your website contained a long and well documented history of corruption (which is what I believe the original context of your sentence implied). What I should have said in reply is that while there are of course well documented cases of conspiracies in the pharmaceutical industry, the proposed link between vaccines and autism is not one of them. The proposed link between vaccines and autism is an as yet unproven conspiracy theory. You can say what you want, but until such time as childhood vaccines are banned (as has happened with the other examples you cite), your supposed facts are merely allegations, and any correlations between the vaccine schedule and autism rates are just that, correlations. I just wanted to clear that up. Now that really is all. For now. The study quoted above has been retracted by the journal in which it was printed and the lead doctor/researcher (Dr. Wakefield) has been stripped of his medical license. Furthermore, it has been proven that Mr. Wakefield deliberately altered the data. ED: Ha Ha Ha Ha. Here is a little tip. Read the article before you post comments. The authors of all the studies cited above will be most surprised to hear their papers have been retracted. Especially because none have been. “Prevalence of autism-spectrum conditions: UK school-based population study” Baron-Cohen S, Scott FJ, Allison C, Williams J, Bolton P, Matthews FE and Brayne C (2009) British Journal of Psychiatry, 194: 500-509. I am not able to post this artical in Facebook. I get the message below. This is an excellent artical and would like to spread the truth! Not sure what you can do about this. Why not take up their offer and let Facebook know you think it is an error.